From the Charité—Universitätsmedizin Berlin (N.A., J.D., S.M., K.G., J.B.-S., J.M., A.U.B., H.Z., F.P. ), Corporate Member of Freie Universität Berlin, Humboldt-Universität zu Berlin, and Berlin Institute of Health, NeuroCure Clinical Research Center; Neurology Department (J.D. ), Multiple Sclerosis Center, Oberhavel Clinic, Henningsdorf; Experimental and Clinical Research Center (J.B.-S., F.P. ), Max Delbrueck Center for Molecular Medicine and Charité—Universitätsmedizin Berlin, Corporate Member of Freie Universität Berlin, Humboldt-Universität zu Berlin, and Berlin Institute of Health; and Department of Neurology (F.P. ), Charité—Universitätsmedizin Berlin, Corporate Member of Freie Universität Berlin, Humboldt-Universität zu Berlin, and Berlin Institute of Health, Germany. 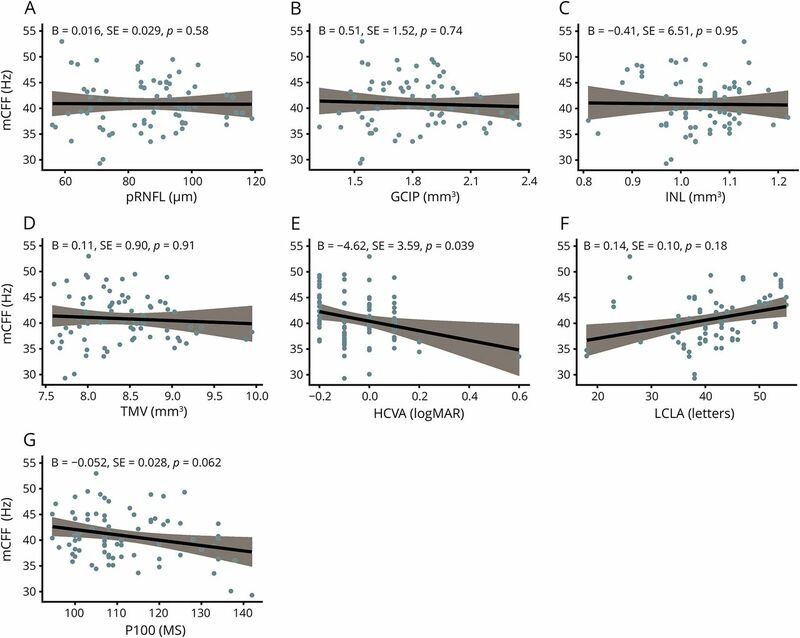 Comparison of CFF measurements between female and male HCs (A) and association of CFF measurements with age (B). HC = healthy control; mCFF = mean critical flicker frequency. 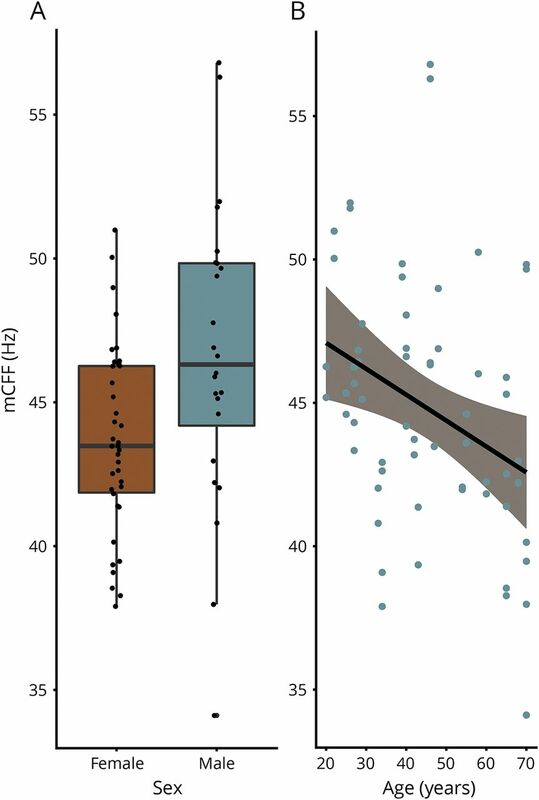 Comparison of CFF measurements between HCs and patients with MS (A) and comparison of CFF measurements between eyes with optic neuritis (ON) and eyes without ON (NON) in patients with MS (B). HC = healthy control; mCFF = mean critical flicker frequency. Association of CFF measurements with structural and visual functional parameters: pRNFL (A), GCIP (B), INL (C), TMV (D), HCVA (E), LCLA (F), P100 (G). After Bonferroni-Holm correction, no p value remained significant. GCIP = ganglion cell/inner plexiform layer; HCVA = high-contrast visual acuity; INL = inner nuclear layer; LCLA = low-contrast letter acuity; mCFF = mean critical flicker frequency; pRNFL = peripheral retinal nerve fiber layer; TMV = total macular volume; VEP = visual evoked potential. 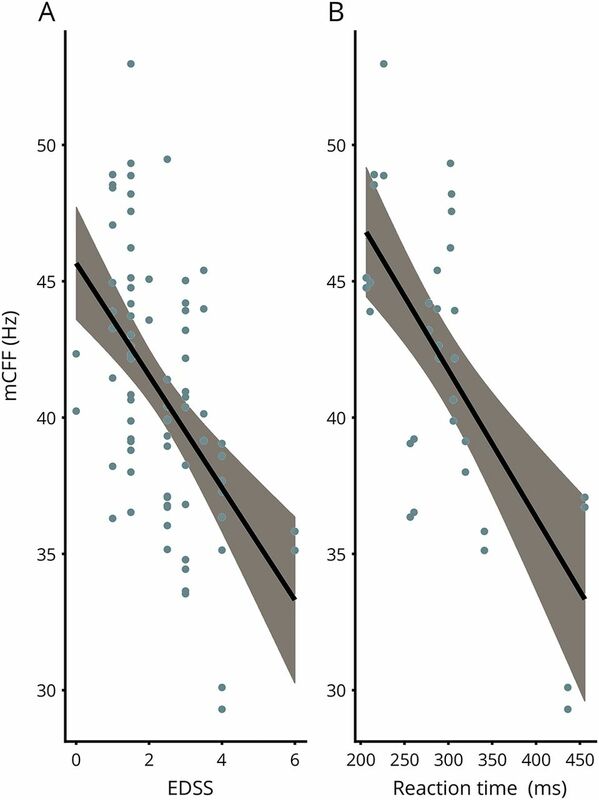 Association of CFF measurements with the EDSS (A) and with reaction time in MS (B). EDSS = Expanded Disability Status Scale; mCFF = mean critical flicker frequency.